What a great quote! And I LOVE these images! Hmm...never thought of it that way - so true! 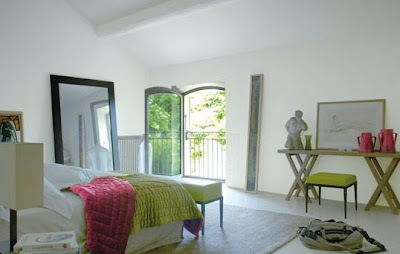 Ohhhh these are lovely, lovely rooms. I adore color and texture and shapes and patterns, and these have all of the above. 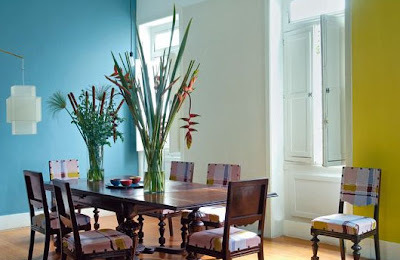 I love the blue and yellow walls in the dining room, they are quite pretty. the blue and yellow in the second pic—WOW! great finds on your other post, too. oh, i do love this quote and it is so true!! i love the splashes of bold color in each of these rooms, especially against the stark white like in the bottom picture, great post! I love the blue wall in the second photo and that ceiling in the last photo is gorgeous.